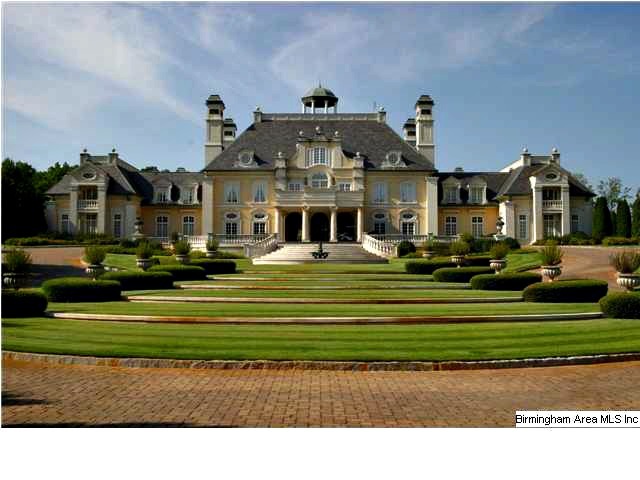 You are here: Home / Appraisal / What is the state of the luxury home market in Birmingham, Alabama? There has been a lot written recently about the real estate market recovery, but most of the data discusses more moderately priced homes. I thought I would take a look at the luxury home market in the Birmingham, Alabama area to see how it has performed over the last several years. For purposes of this study I decided to look at all homes that have sold for $800,000 and above, and I decided to begin in January of 2005. By the way, my research utilized the Birmingham Multiple Listing Service, however it is always possible that there could also be some privates sales within this price and time range which were not included. During this time period there were approximately 1,183 homes that sold over $800,000, with the highest price being $4,200,000. This house was located in the Greystone development in Shelby County. This is a golf course community with house styles ranging from small garden homes to large custom built residences. It was surprising to me that the highest price home did not occur in the city of Mountain Brook where many upper priced home sales occur, however I should note that the second highest price sale did occur here. Over this roughly 8 year period the number of home sales varied quite a bit, which is understandable given the state of the real estate market. The greatest number of sale occurred during the second quarter of 2007 when 61 homes were sold, and the least amount of homes sold occurred during the first quarter of 2010 when there were only 11 home sales. Take a look at the chart below to see the wide variation of sales volume during this time period. It appears that since bottoming out in 2010 home sales has slowly started to increase. Since the low point the greatest number of sales occurring took place during the second quarter of 2013 when there were 47 sales. This type of volume for upper priced homes has not occurred since the second quarter of 2008, when there were 50 sales. At the current time we are experiencing an upward trend in sales volume as you can see in the chart. The other statistic I wanted to share with you is the median sales price of these luxury homes. There was quite a big difference in sales volume over the time period I looked at but this was not the case with the median sales price. 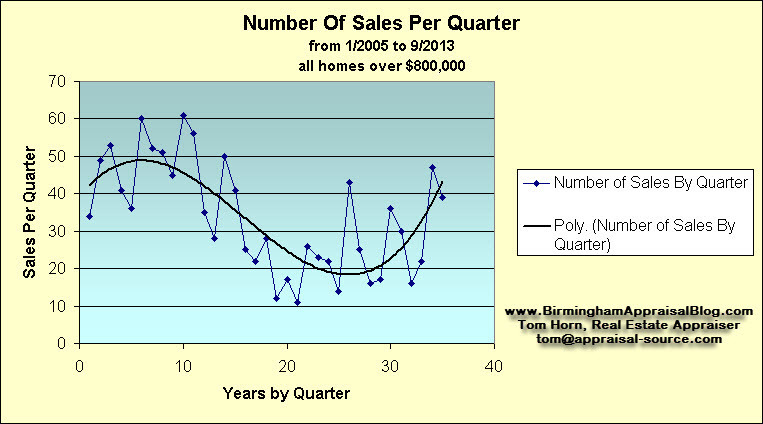 The difference between the high and low median sales prices for each quarter during this time period was $371,000. 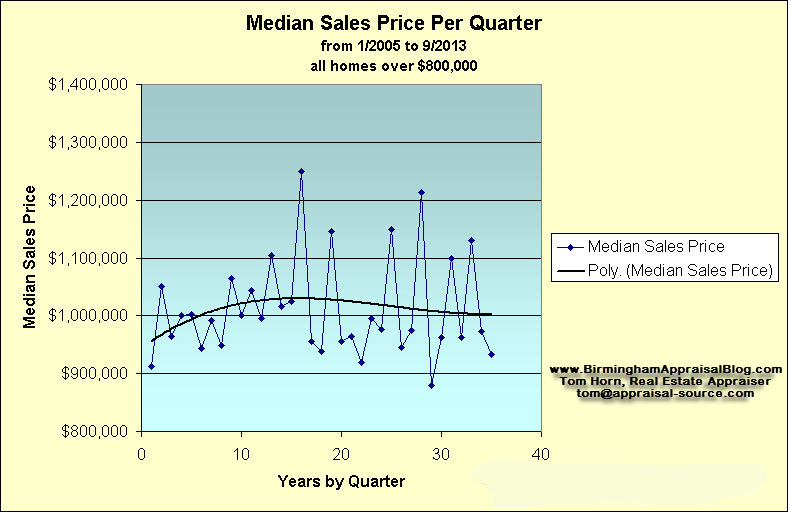 Take a look at the chart and see what the trend for the median sales price looks like. The relative stable nature of the trend is understandable when you consider that the median price is not as sensitive to the highs and lows as the average price is. At the current time the Birmingham Multiple Listing Services shows that there are approximately 166 homes available for sale over $800,000. They range from $806,811 to $13,900,000, however the high listing is a rather unique property located on 27 acres which I have written about before. The next highest price below that is $4,900,000, which is more in line with the other homes we have talked about, and by the way is also located in the Greystone subdivision. Multiple listing data shows that the prices of luxury homes over $800,000 in the Birmingham market has been rather stable over the past 8 years, however sales volume has fluctuated quite a bit, but appears to be headed back to pre-real estate bubble levels. What does the luxury home market in your area look like? Hey blogger thanks for such kind of blog post because its really very informative that provide the various types of information. Over this roughly 8 year period the number of home sales varied quite a bit, which is understandable given the state of the real estate market. Thanks a lot for sharing this kind of information with us. That is an amazing house in the photo. Wow. That’s actually the home that is listed for sale at $13.9 Million. It’s a very nice home with acreage.